Are you expecting? Do you want to find the perfect way to let your friends and family know the gender of your baby? Hudson & Heart Co. makes the most unique gender reveal kits! Surprise your friends and family; throw a party and open the box and let friends find out if you are having a girl or a boy. Gender Reveal Kits come with one lovey, milestone stickers and an old wives tale game. Are you expeting more than one twins, triplets maybe even more. No worries! 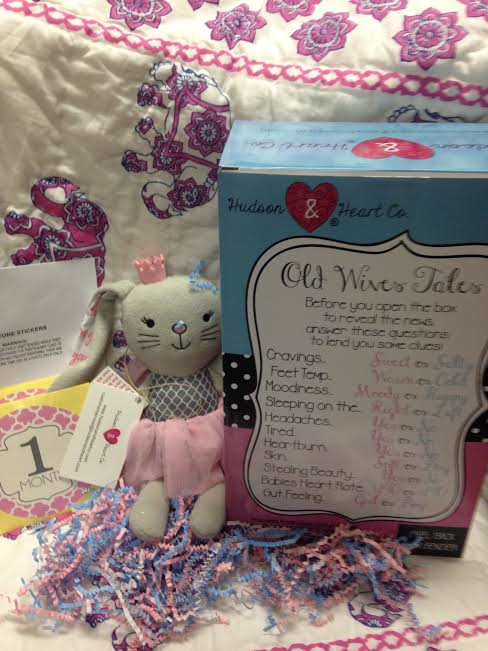 Hudson & Heart Co. has you covered add an extra lovey to any kit for only $19.50. Or if you just don't want to leave your other children out add additional loveys for siblings for only $18. Sierra absolutely loves her lovey. She loves bunnies in geberal. She thinks her bunny is a princess because of the crown. I love the milestone stickers I used them to decorate her baby book. They are so cute and make the perfect added decoration to her baby book pages. They really make the pictures in her baby book come to life. They are great for monthly pictures. If I was picked, I'd gift this to my daughter, Bella! She'd LOVE this! It would be awesome for grandkids. It would be for my grandkids.